The disease of town pubs - inability to serve wine in a wine glass - is sadly spreading to Central London; how utterly embarrassing. This is a better bar than some of these reviews imply, with a nice buzz to it, being in a good location and with big windows for a view outside, and some well-positioned benches and tables. The interior and decor is modern and not completely lacking in character; perhaps it's changed since some of the other stinging comments. All Bar One's presentation style, with wines up above and prices visible, is pleasing, and there's a nice choice. However, I was astonishingly served wines in two beer glasses. The bargirl was smiley and apologised, but when the same happened for my second round, I'd rather had enough. It's embarrassing and silly, and there's no excuse for it. There were numerous glasses on tables waiting to be collected. I asked the person serving me (this one being far more surly) and her attitude was defensive and full of meaningless excuses. "We're busy, it's not every day, I haven't got time.." - even though I had already made it clear I wasn'y blaming her personally. Pathetic, and a bit of a pity as the pub's really not bad otherwise. This is another rather uninspiring ABO with lots of Wood, Premium lagers and Wasabi Peas, although there is some token London Pride. 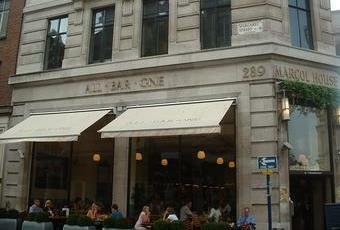 There is so much better in this area � Why drink in All Bar One? Gets really busy but hey - it's in Regent St. Beers are cold which is more than you can say about most of the places round here. Good place to wait during a shopping marathon! Makes you think it's more "wine in the evening" than "beer in the evening". Stupendously loud so that you have to shout at your friends and can't hear what they reply. Hideously packed - a bit like trying to drink on a rush hour tube train. Full of apparently affluent types - unsurprisingly, perhaps, given the location. I have been once and haven't been back, despite working about 2 minutes away. So I suppose I don't like it that much. But is it much worse than a lot of other places? Hmm. Probably not. So it's not really a pub then. But as it calls itself a bar, you can't complain. If you wanted a pub, you don't want this. Wetherspoons for the snobbish upmarket types who would like to think they are the 'beautiful people'. Basically a nice non-threatening venue for people who don't like pubs - or don't get out much. The IKEA furnishings give it the atmosphere of a clap clinic waiting room: cold, sterile, but with less interesting people. I reckon the staff come from more different countries than the lagers on offer. They have a limited command of English, look bored and couldn't give a monkeys. Also a ponce haven, packed after 4pm with suits, all bellowing crap at each other and constantly scanning the room because the company they're in is SO desperately boring. The acoustics are dreadful which exacerbates the noise. I feel a headache coming on just thinking about it.